Thank you for supporting the NL King and taking a look at my NL Only fantasy baseball advice articles. You can follow me on Twitterand join my army @TheNLKing. Today we break down NL Only First Base 1B rankings. I am going to break it up into two groups called the Old Guard and the New Guard. As the late great Jackie Gleason once said "And Away We Go." Joey Votto - CIN - Quite simply, Votto is the best 1B in the NL as well as one of the top NL roto hitters. The only question is regarding last summers' knee injury. Is Votto's knee 100%? When he came back from his knee surgery in early September he was just a singles hitter. Follow Votto's spring training closely and see how his knee is doing. If the knee is 100% with no issues put him #1 on your 1B rankings and one of the top players to get in your draft. Adrian Gonzalez - Gonzalez has another change of scenery as he leaves the microscope of Boston. However there are huge expectations on the Dodgers this year and will be interesting to see how A-Gone handles that? Is Gonzalez one of these players better off in a small market like San Diego where no one bothers him and he can just put up numbers? I believe with the talent around him should be at least 25-100-80-.285+ hitter in Hollywood. Ryan Howard - PHI - Howard came back in the second half and while posted a poor average did have strong power numbers for 67 games. Howard days of those monster years of 50 HR's and 135RBI+ are over. However, Howard should still be a guy who will give you low 30's in HR's with 100+RBI and 80+R's but figure on a batting average around .250. Adam LaRoche - WAS - Finally signed with the Nats. He is coming off a career year but there is a lot of talent around LaRoche which should help his numbers. LaRoche is a very streaky player in his career so if you wind up getting him you must stay the course. While I don't think LaRoche will have the year he had last season he should give you solid value in 2013. Corey Hart -MIL - I would have Hart 3rd on this list if it wasn't for his recent knee injury. They are still sorting out that injury but it seems like Hart will have to have surgery and miss the 1st 4-6 weeks. Also Hart is a free agent after the season and if the Brewers are not contending will they trade Hart this summer? Again a safe bet when healthy but there are some major questions. Garret Jones / Gaby Sanchez - PIT - Going into last season if I asked any roto owner who was the better player they would say hands down Gaby Sanchez. But Jones had a career year and Sanchez had a year to forget. Having said that , if Jones goes back to being a .240 mistake hitter and Sanchez goes back to being the solid hitter he is it's Sanchez who will be the starting 1B for the Bucs. Also while Jones can qualifies for OF which adds that extra value. Todd Helton - On the last year of his mega deal. Helton will be 40 years old in August and quite frankly unless he can show he is healthy and can be productive the Rockies have other options for 1B and they will move on from Peyton Manning's former backup QB at Tennessee. Follow his spring but even with a strong spring he is nothing more than a late draft flyer. 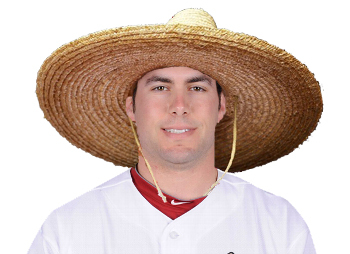 Paul Goldschmidt - ARI - He was a quiet 5 category player last year. That ball jumps in Arizona and the D-Backs have a nice supporting cast even if they trade Justin Upton. He won't be cheap come draft day but a strong pickup. Ike Davis - NYM - Started the season very slow due to what was probably effects of Valley Fever but having said that Davis still finished with 32HR's and 90RBI's. Throw out Davis average last year he is at worst a .260 hitter. Allen Craig - STL - If I knew he would play at least 145 games next year I would have him 2nd on this list. Has run into the injury bug which is the only red flag here. Also qualifies for the OF. Anthony Rizzo - CHC - Goes to show you with young talented players that sometimes a little patience can really pay off. Granted it was just 85 games but great half a season for Rizzo. However, the league will adjust to Rizzo and he'll have to be ready for that. While I believe Rizzo will be a really good player there could be some growing pains in 2013. Brandon Belt - SF - Finished up the season very strong and if Belt is going to reach his potential and be the Giants 1B for the next few years this is the year Belt has to distinguish himself. I think it's 50/50 Belt takes that positive step so based on that do not overpay on draft day. Logan Morrison - MIA - Very talented BUT needs to stay healthy and be a lot more consistent. As I write this there are questions if Logo will be ready for opening day. On top of that anyone on the Marlins seens to be trade bait as well. Morrison also qualifies for the OF. Follow his spring to see how he is health wise. Could be a nice pickup if he goes cheap in your draft. Yonder Alonso - SD - Was a line drive hitter when he was in the Reds system and then moved to Petco. If you can get him for cheap price on draft day he could be a bit of a stat filler as your 3rd corner. Join my Twitter army @TheNLKing. Next up, 2B which is lost cause in the NL.